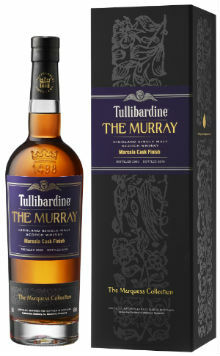 Tullibardine have continued apace with adding another expression to their Marquess Collection with the release of the Marsala Cask Finish. Just a few months ago they released a Châteauneuf-du-Pape cask finish, which wasn’t quite to my taste (wine finishes aren’t quite my thing) but having sampled a number of Marsala-influenced whiskies in the last 12-18 months, I’m rather intrigued by how this whisky is going to play out. Matured for the majority of its life in first fill bourbon barrels, it then spends about a year in Marsala casks before being bottled at 46%. Nose: Fruit and Nut Dairy Milk, toasted vanilla pods and almonds, then a whack of stewed fruits; apples, plums and pears. There’s a bit of Juicy Fruit chewing gum, and underneath a bit of tannic spices; peppercorns, cinnamon and clove along with some dusty oak. Palate: Very syrupy to start with; those stewed fruits return, along with cherries, blackcurrant cordial, prune juice and syrup of figs. There’s also a bit of chocolate orange, clove and a touch of espresso. Finish: Moves into rather dark territory, with dark chocolate, black tea, toasted raisins, and some brambles. Overall: A decent return to form in my opinion, after a rather disappointing showing with the Châteauneuf-du-Pape cask finish. The Marsala influence is really quite apparent, but doesn’t overpower the spirit too much, with elements of the bourbon maturation coming through quite nicely. It does err on the syrupy, sweet side, particularly on the palate, so be warned, but the rich, earthy finish is rather satisfying. Speaking more broadly, it’s just great to see this distillery being given more airtime and showing what the spirit is like having spent time in different types of cask. Keep them coming! This entry was posted	on Monday, January 28th, 2019 at 10:48 am	and is filed under Reviews. You can follow any responses to this entry through the RSS 2.0 feed. You can leave a response, or trackback from your own site.